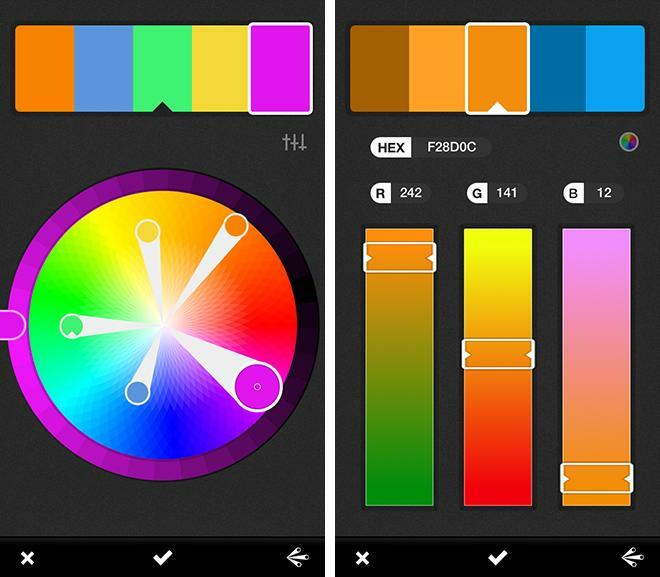 After being announced in 2011, and promoted earlier in May, Adobe's Kuler color-picking iOS app hit the App Store on Thursday, offering an easy method for artists to capture and modify color swatches while on the go. Kuler uses the iPhone's camera to capture five points of color in any scene, tweak and save the color theme, and send the palettes to Illustrator CC or Ideas. Alternatively, color themes can be uploaded to a new Web-based interface, also called Kuler, which launched alongside the app. As outlined by Adobe earlier this month at Adobe MAX, Kuler continuously and dynamically chooses five spots of an image that, when combined, are representative of a scene's color theme. 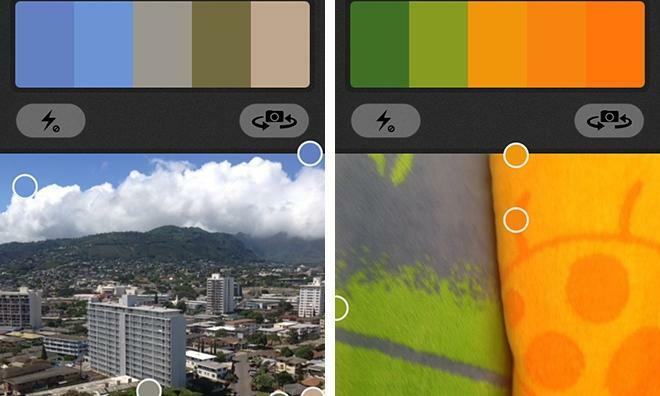 For example, in the above screenshots, the app captured a spectrum of colors from an outdoor scene and a high-contrast composition to create two unique color themes. While these particular samples were taken from a live camera preview, the app can also sample the same number of colors from an image saved in a user's library. From there, users can fine tune the swatch by selecting a color point and adjusting its position on the image. Tapping and holding on a dot brings up a magnifying glass tool that can be dragged around the picture, with a two-tone ring displaying both the color of the original point and the new area selected by the user. Those familiar with Adobe's software will recognize the feature as being similar to the eyedropper tool. There are a number of options within the app to tweak color sets after a palette has been selected, including RGB sliders, a color wheel and preset color modes, among others. These options are also available on Kuler's website. Satisfied with a chosen color theme, a user can upload the results to the Web interface or use the swatch in other Adobe apps like Illustrator. The Kuler website is actually a type of online community where people can share their themes and browse those created by other users. Kuler is available as a free download from the App Store.